Want Premium Templates for free. You came to the right place. How to install Twit Plus? Two column Twitter style layout. 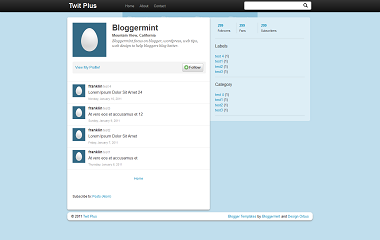 Descriptions Twit Plus Blogger Template is a free blogger template whose Layout is like the Old Twitter. It also has Hover effect on posts. It has features such as 2 Column, Top Navigation Bar, Custom Menu, Unique, Blue, White, Twitter, Fixed Width, Web 2.0, Auto Readmore, Widget Ready, Bookmark Ready and many more. This template is suitable for all kinds of blog. Oops! there was only one comment.. come on speak up! I might be very thankful if you continue with nice what you are serving right now together with your weblog... custom essay writing service I virtually enjoyed it...and i simply recognize to you for this....its usually pleasure to study so....thanks for sharing!!! How To Upload/Install a Blogger Template.